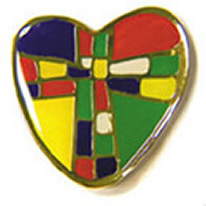 This pin symbolizes the unconditional love God has for all people. The heart surrounds a cross, the sign of Jesus' loving sacrifice. These universal symbols of love are filled with colorful mosaic pieces.